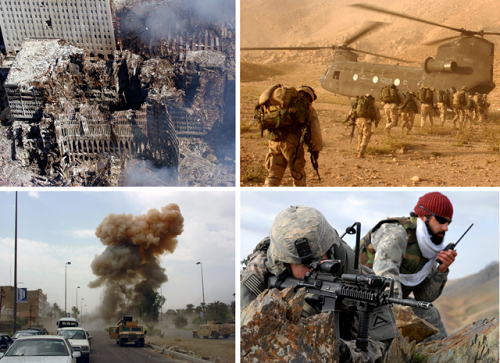 Throughout history, the United States has led, embarked in, participated in, and supported several wars. The Cold War and the War on Terror are two among the most recent and striking examples of the U.S. tendency to take action to halt the advance of ideologies or beliefs deemed dangerous for the entire world. Fearing an uncontrolled spread of the communist ideals, the U.S. engaged in a Cold War against the Soviet Union, whereas, fearing the perilous growth of terrorist groups and attacks, former U.S. President George W. Bush initiated the so-called War on Terror. In both cases, the United States’ actions disproportionally affected the targeted countries (in the case of the Cold War, we refer to Korea and Vietnam). In the chaotic aftermath of World War II, the United States’ main concern was slowly but relentlessly spreading from the East. The Soviet Union, which had fought alongside the U.S during the war, represented a serious threat to the American supremacy on a global scale. Furthermore, besides fearing the Soviet expansionist tendencies, the United States was alarmed by the power and the appeal of the communist ideology that was sinuously infiltrating Western countries. Therefore, former U.S. President Henry Truman inaugurated the well-known “containment policy” aimed at protecting and supporting “free people” from the insidious advance of the subjugating power. It is hard to say which “subjugating power” Truman feared the most: while a victory against the rising Soviet Union was a tough but achievable goal, defeating an ideology seemed a much harder task. Normally, we believe that the Cold War did not bring about casualties and destruction. In fact, the term “Cold War” itself refers to the mounting tensions between the two superpowers. Such tensions, however, never fully escalated into a direct conflict – which could have been deleterious for the whole world. As far as the nuclear race is concerned, both Americans and Soviets – blatantly disregarding the detrimental impact of atomic weapons on human lives and on the environment – invested in the development of weapons of mass destruction. Luckily, the nuclear race remained limited to a developmental and testing phase, and no nuclear arm was ever used after the end of World War II. Yet, the creation of the American “Superbomb” and the constant replies of the Soviet counterpart spread fear and uncertainty across the world. Americans and Soviets also competed for the primacy in the space. The U.S. replied to the launch of Soviet R-7 intercontinental ballistic missile Sputnik with the creation of the National Aeronautics and Space Administration (NASA), and definitely won the space race in 1969 when Neil Armstrong became the first man to set foot on the moon. During the Korean War, the Soviet Union backed the communist North during the invasion of the Pro-Western South that enjoyed the American support. During the Vietnam War, the United States invested billions of dollars and sacrificed thousands of able soldiers (15.000 American soldiers lost their lives, and 3 million people were killed during the war) to assist the nationalist South opposing the communist North led by Ho Chi Min. The two conflicts were extremely deadly and costly, and their impact cannot be ignored when we evaluate the casualties and the backlashes of the Cold War. The tensions that had kept the whole world in check for decades began to loosen when U.S. President Richard Nixon engaged in diplomatic efforts and promoted a policy of “relaxation” towards the Soviet Union. The Cold War finally ended when the Soviet Union collapsed in 1991. Indeed, the fear and the outrage provoked by the attacks caused a wave of political and economic reactions from all countries, and fueled dangerous anti-Islamist feelings in many citizens of the Western world. The popularity of President Bush soared after he promised to destroy and eradicate the terrorist threat from the face of the earth. However, after only few months, many began to question the effectiveness of the American strategy. Serious damages to the U.S. reputation all over the world. The huge costs have had serious backlashes on the American economy. Furthermore, there is large evidence that the U.S forces have employed illegal and inhuman methods of detention, and that the “enhanced interrogations techniques” – approved by the former Secretary of Defense Rumsfeld and used against alleged terrorists – clearly contravene international standards prohibiting the use of torture and ill treatment. Former U.S. President Obama was awarded the Nobel Peace Prize for dropping the term “War on Terror” and for withdrawing the U.S. troops from Iraq; however, the war against terrorist groups never ceased, and President-elect Donald Trump seems determined to boost military and defense expenditures in order to defeat ISIS. Both the Cold War and the War on Terror have seen (and still see) a large involvement of the United States, and both aimed at eradicating an ideology deemed dangerous or threatening for the Western order. The Cold War slowly began in the aftermath of World War II and ended with the collapse of the Soviet Union, while the War on Terror was declared after the 9/11 terrorist attacks and is still ongoing (even if al-Qaida is no longer the main target). The two conflicts have had serious backlashes for the American (and the global) political and economic stability, have provoked a large number of avoidable casualties, and have been extremely costly. The Cold War was eventually brought to an end thanks to peaceful diplomatic efforts whereas not only is the War on Terror far from being over, but it has also contributed to the emergence of an even more dangerous terrorist threat, and peaceful or diplomatic settlements remain out of the picture. Giulia Squadrin. "Difference Between Cold War and War on Terror." DifferenceBetween.net. May 31, 2018 < http://www.differencebetween.net/miscellaneous/politics/difference-between-cold-war-and-war-on-terror/ >.